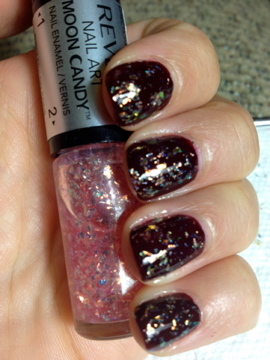 Catrice Heavy Metalilac is a completely gorgeous polish that I received in a swap, of course. This was two coats, with no top coat. I added Wet n Wild Tonight's Gonna Be A Good Night to my middle and ring fingers. Ermahgerd, black and gold glitter, wuuutttt??!?! LOVE! The glitter wasn't difficult to apply: one coat on each finger. I did move some of the gold pieces around a bit. These photo's are with top coat. The Wet n Wild Fergie collection is out right now; I picked mine up at Walgreen's! Did everyone have a good weekend? I spent the entire weekend watching the Olympics. Literally, I did almost nothing else! Sad, but true! LOL I swear, I need to take vacation for the next Olympics so I can stay up late to watch everything. 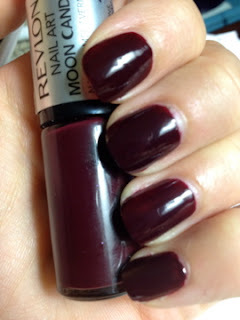 Today I have the Revlon Moon Candy Nail Art polishes to show you! There are lots of pictures so I'm just going to get right to it! All of the polish was 2 coats, unless otherwise noted. Satellite is a plum burgundy creme. Supernova is a gray creme with pink flakies. Milky Way is a darker gray creme with silver flakies. Universe is a brown creme with yellow flakies. Cosmic is a yellow toned green with yellow/gold flakies. 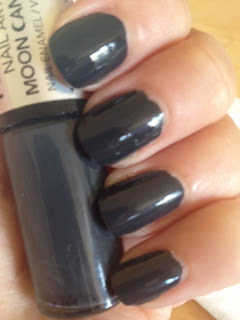 Moon Dust is a black creme with iridescent flakies. Galactic is a dark blue creme with blue flakies. Orbit is a dark purple creme with purple/blue flakies. I liked these but I didn't loooove these; in fact, I was a bit disappointed. The polishes were all easy to apply, no streaking issues. The flakies were a little underwhelming and several of the colors were really similar. I love Galactic, Moon Dust, and Orbit the most. I used probably 1.5 coats for each flakie, and there is a visible usage line on the 'pen'. Obviously, it's a much smaller container than a standard polish. That shows you how often I use the same polish, lol. These are available at Rite Aid, Walgreens, and probably anywhere else that sells lots of Revlon. Today I'll be showing you the Cult Nails Untamed Collection. This collection was created by Maria's daughter, Coco. She did a bang up job! Clearly, creativity runs in this family! Deal With It: 3 thin coats. This lime green is packed with shimmer and is such a great color and so perfect for a 13 year old to invent! Definitely fun and very on trend with the neons and bright colors we're seeing so much of this season. Annalicious is named for Coco's best friend, Anna. You know by now that I'm not the world's biggest fan of red but this! I love this! Golden shimmer! It reminds me of the red version of the China Glaze Riveting that I love so deeply! Spontaneous took 3 coats. Well okay, it would have been only 2 but I messed up so I had to use 3. Pretty purple with Cult Nails signature shimmer. I Got Disctracted. I am not sure if this color is black or green. It looks black in the photos but green in person. I think the glitter was 'disctracting' me, haha! This was a little bit thick but 2 coats was perfect. 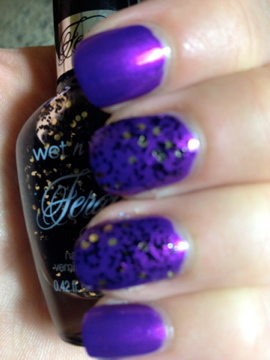 The last photo shows the polish with a topcoat. I'll be honest, I wasn't expecting to like this collection as much as past collections from Cult Nails but I really enjoyed these colors more than anticipated! Great job, Coco! You can purchase Cult Nails on their website.